We've all heard about the magical land called Facebook. Where 1 in 7 people on Earth use Facebook to connect with their friends and family. 1 in 7! Holy Cow! We live in an amazingly open and connected world where people we know (as well as ourselves) are able to express and share our most intimate thoughts and moments with those we love. And we all know an Uncle Charlie who just shares way too much! As a practitioners and business owner, reaching out to your potential patients and customers to let them know about your acupuncture practice and services has never been easier! 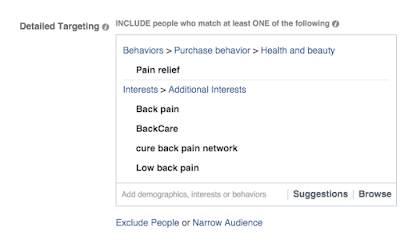 In this first of a series of posts I'll be showing you how you can use Facebook Ads to reach those potential patients. But before I get into it, I want to address what many of you might be thinking, which is the creep factor of Facebook. Yes, I agree, there is a certain creep factor. The amount of data, an advertiser has access to on Facebook is mind blowing. Especially when people are even willing to share health information about themselves in such a public way. Sometimes, I'm creeped out! However, another way to think about it is that there are people out there that need your valuable acupuncture service and healing and the best thing you can do for them is to let them know you are here to help. We're on a mission to SAVE the world! Alright, so let's get cracking and create our first Facebook Saved Audience! A Saved Audience is just a group of people on Facebook that share a set of common attributes that you've specified (ie. demographics, interests, behaviors, etc). 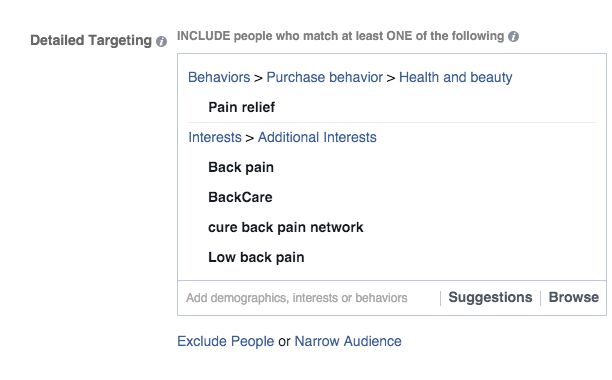 In our example today, we'll create a Saved Audience targeting people with back pain. Ouch! At first glance and if this is your first time using the Ad Manager, there's a lot going on. But we're going to start out simple (Keep It Simple Stupid!) and go straight for the Power Editor and give out a loud grunt like Tim "The Toolman" Taylor... har har har! The Power Editor, as the name would indicate, is a more powerful version of the Facebook Ad tools with more functionality. Just call me Captain Obvious! When creating our Facebook Ads, most of the time, we'll be working strictly within the Power Editor. We ain't got no time for playing around with the kiddie toys! Once in the Power Editor, click on the Audiences' Tab which shows you a list of all your Audiences and the ability to Create Audience. Next, click on Create Audience and in the dropdown menu, click Saved Audience. The Create Saved Audience dialog will appear and the first thing we'll enter is the Audience Name. 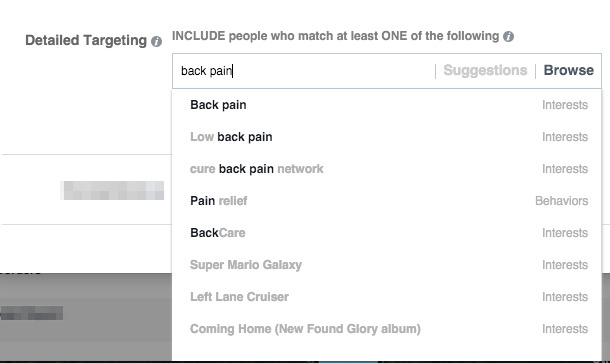 In this example, we're targeting people with back pain, so we'll call it "People with back pain". Aren't you amazed at my descriptive naming skills?! We'll then go down to the Locations section and add the city our practice is located. This will restrict our ad to only people in this region, saving us money by making sure only people who are physically able to come to our office, see the ad. Location, Location, Location! The Detailed Targeting section is where the magic happens and where you're limited only by your own creativity. 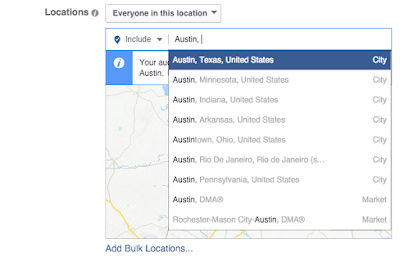 In Detailed Targeting, you list attributes about the person you're targeting with your ad. This is where really knowing your patients is important. What do they looks like? Where do they work? What do they like to do? What are their interests? Take some time to imagine who your patient is! In our example, since we're targeting people with back pain, we could target people in the IT industry, who work at a desk most of the day. Or we could target construction workers, who have to lift heavy things all day long. In this example, we'll keep it simple and type in "back pain" and see what we get! OMG! Look at all the different ways to target people with back pain! We have people interested in "Back pain", "Low back pain", "cure back pain network", "Pain relief", and "BackCare". We need to help all these people! When done with the Detailed Targeting, scroll back up to the top to see the Potential Audience. This is the estimated size of the audience given the criteria specified. In our case, there are 38,000 people in Austin interested in back pain! And by inputting different options, the Potential Reach will change, so play with it and see what you get! When you're satisfied with your Audience, click the Create Audience button at the bottom of the dialog. And, you're done! 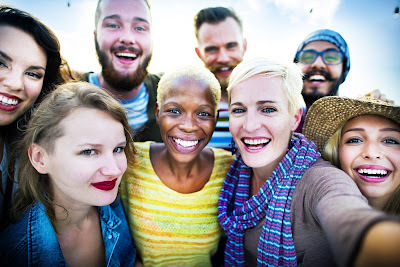 I encourage you to create many different Audiences and in the next post, we'll talk about using these Saved Audiences to create a Facebook Ad Campaign.